Are you hesitant to do outreach because you don’t really know how to convey your message to an audience that isn’t as fascinated by your field as you are and doesn’t have at least some background knowledge? 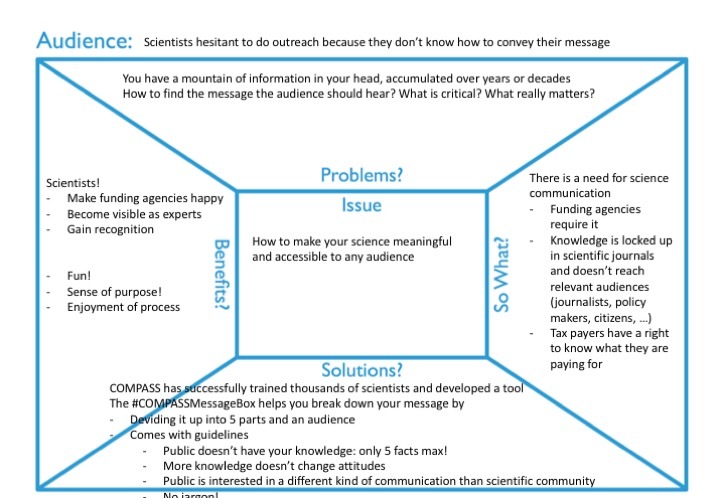 Then here is a tool that will help you make your science meaningful and accessible to any audience! First: There is a need for science communication and we all know it. The obvious reason is because these days, pretty much all funding agencies require some form of science outreach or dissemination. 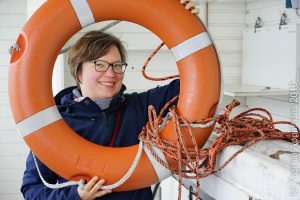 Other reasons for wanting to do some form of science communication are that tax payers are funding a lot of the basic research going on and that they therefore have a right to know what they are paying for; and that the knowledge we create mainly gets locked up in scientific journals or presented at scientific conferences, but it doesn’t reach relevant audiences by itself. And then you have a mountain of information in your head that you have accumulated over years or decades by studying and doing research on your topic. How do you find the message the audience should hear? What is critical? What really matters? And who is your relevant audience? Journalists, policy makers, citizens? School children? Anyone else? What is the overarching topic you are working on? What solutions are you providing? What are the benefits if this problem was addressed? “The public” doesn’t have your background knowledge, therefore boil your message down to 5 new facts max! More knowledge doesn’t change attitudes, so don’t just lecture your audience, listen to them and interact! We have all been trained to communicate to a scientific audience, using specific norms. The public, however, is used to and interested in a different kind of communication than scientific community, so adapt the way you structure your information! Last, not least: No jargon! Don’t “waste” one or more of your five facts on introducing jargon! P.S. : Below you see one example of the #COMPASSMessageBox, filled with the stuff I wanted to write about in this blog post. Give it a try, it’s a really useful tool! This entry was posted in literature, method and tagged #COMPASSMessageBox on August 18, 2017 by mglessmer.